The Papua New Guinea Liquefied Natural Gas (PNG LNG) project commenced exporting gas to China, Korea and Japan in May 2014. Under agreements reached in 2009, landowners of eight petroleum licence areas, eight pipeline licence areas and a liquefaction plant site near Port Moresby were to receive royalties. By February 2019, payments had been made to people in only the last of these areas. The identification of landowners has been a major difficulty, and assigning responsibility for completing the task has been a matter of debate. At the close of 2018, social mapping and landowner identification studies carried out by consultants to petroleum companies, clan-vetting exercises carried out by officers of the Department of Petroleum and Energy, and alternative dispute resolution processes implemented by the judiciary had failed to solve the problem. By this time too, agreements for two other LNG projects (in Western Province and Gulf Province) were under discussion. In January 2019, Petroleum Minister Fabian Pok told parliament that the government would not repeat the mistakes of the first LNG project. He wanted the companies to be responsible for identifying landowners in the new LNG project areas and he wanted this done before those projects moved to production. On January 23rd, referring to the Gulf Province LNG project, Prime Minister Peter O’Neill said that the government “had tasked the developer to do the landowner identification process” and Minister Pok reported that Total – the developer – had agreed to do this. The small print is not yet to hand so we cannot be sure just what the government has requested or what Total has agreed to do. 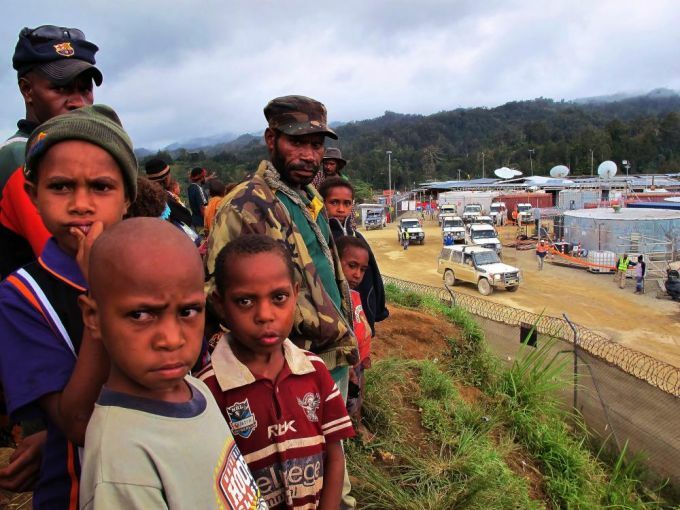 Here, however, we argue that ceding responsibility for landowner identification to the petroleum companies is a seriously bad idea – bad for the companies, the government and for the people of Papua New Guinea. Under the Oil & Gas Act 1998, final determination of landowner beneficiaries for a petroleum licence area is to be made by the responsible minister and gazetted as a Ministerial Determination. Recent determinations provide a record of landowner beneficiary identification for specified licence areas or pipeline segments. Those determinations name clans (variously ‘major clans’, ‘stock clans’, ‘beneficiary clans’) but do not name individuals within those clans. With reference to differential benefit-sharing arrangements they may subdivide clans as ‘highly impacted’, ‘least impacted’ and ‘invited’. The diagram below shows some categories of landowner beneficiaries appearing in recent determinations and in clan-vetting exercises that precede and feed into those determinations. 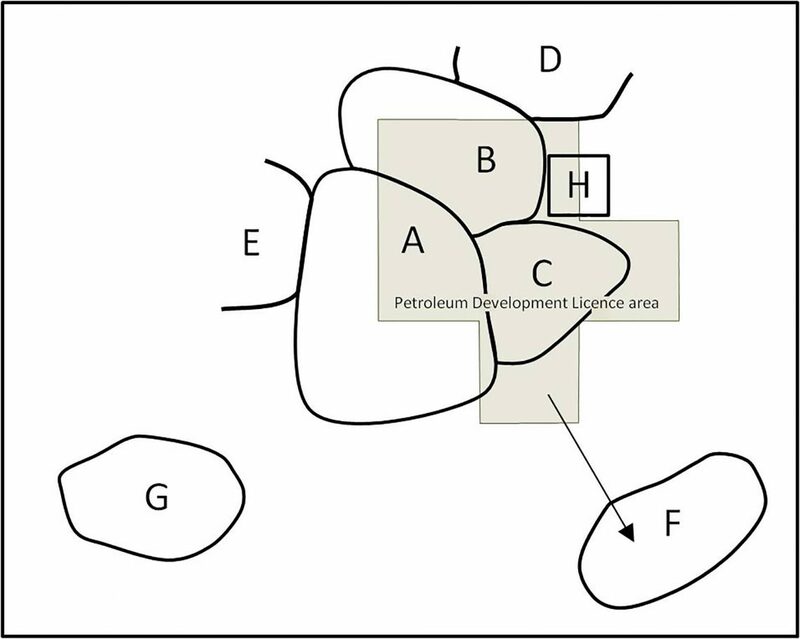 On the diagram, the boundaries of the lands of clans A to G are shown relative to a Petroleum Development Licence (PDL) area. Clans A, B and C are classed as landowner beneficiaries on the basis of long-term residence and use. Clans D and E are ‘invitees’ initially recognised as landowner beneficiaries on the basis of boundary-sharing with A, B or C with the possibility that they are subsequently granted equivalence with those clans. Clan F is classed as a landowner beneficiary on the basis of asserted ancestral connection and an ideology of rights to land being held in perpetuity. Clan G is an ‘invitee’ recognised as a landowner beneficiary on the basis of assistance rendered to A, B and C. H is a private citizen, or group, that holds registered title to a portion of the PDL area and, on this basis, under the Act is a landowner beneficiary. The concept of ‘landowner’ is being used here in a broad and fluid sense. It is not used in agreement with any likely academic definition, with any detectable legal rigour or in conformity with a pan-PNG ideology of tenure because, of course, there is no pan-PNG ideology of tenure. The Oil & Gas Act requires that a company applying for a PDL must submit a “full-scale social mapping study and landowner identification study of customary land owners” of that licence area. Under the Act, customary landowners are persons whose relationship with the land has to do with “rights of proprietary or possessory kind”. Not all clans identified as landowner beneficiaries in Ministerial Determinations satisfy this definition. And the status of others, both the included and the excluded, as members of this category will be always amenable to contention. Several possibilities are implied in the diagram. For example, a judgement that clan C was ‘more impacted’ than A or B because all land attributed to C is within the PDL area while portions of land attributed to A and B lie outside that area, could be challenged by the latter clans on the basis of area or numbers of people affected. Similarly, members of A, B or C could well have different opinions regarding acceptance of D or E as ‘invitees’ and their possible upgrading to the status of landowner is even more problematic in being politically, rather than empirically, motivated. Inclusion of F as landowner will be dependent on assessing the validity of accounts of ancestral connections from claimants who may well have competing agendas. Finally, inclusion of G could elicit claims from other clans that assert that they too provided assistance to A, B and C. Resolving problems of these kinds cannot be achieved by an anthropological study of ‘in situ’ land ownership. These sorts of problems are ultimately resolved only by facilitated negotiation with those charged with identifying landowners, or by litigation. No petroleum company can produce a list of clans that will conform to, or satisfy, the sorts of decisions that currently inform Ministerial Determinations. They did not do so in the past and they cannot do so in the future. If companies now assume responsibility for producing a definitive list of landowner beneficiaries, there will no longer be any ambiguity about who to blame or who to take to court when the list is considered defective. The fault will be theirs. On these counts, the desire to shift responsibility – or at least the perception of responsibility – to the petroleum companies might, in the short term, prove beneficial to the government in domains of financial management and public relations. There is, however, another reason why responsibility for identifying landowners should remain with the government. Only Papua New Guineans – the PNG government, courts, and the landowners themselves – can determine who owns the land in Papua New Guinea. This responsibility should not be ceded to outsiders. It should not be ceded to American, Australian, Chinese or French companies. Papua New Guinea is not their country. They are guests. Only Papua New Guineans can determine what is right for Papua New Guinea. The petroleum companies should recognise and acknowledge this and step back from this area of decision-making. The government should also recognise and acknowledge this and step forward to ensure that the rights of all Papua New Guinean woman and men are guaranteed by Papua New Guineans.